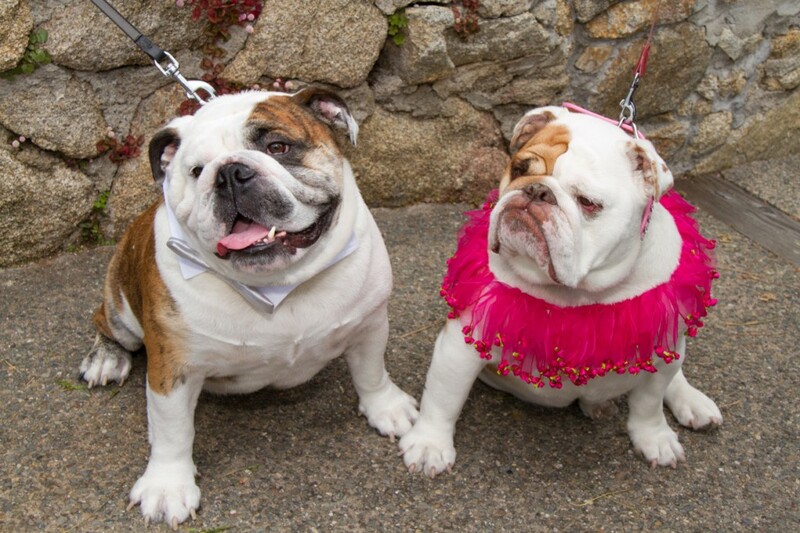 REAL Weddings: VIPs (Very Important Pups) and Their People! 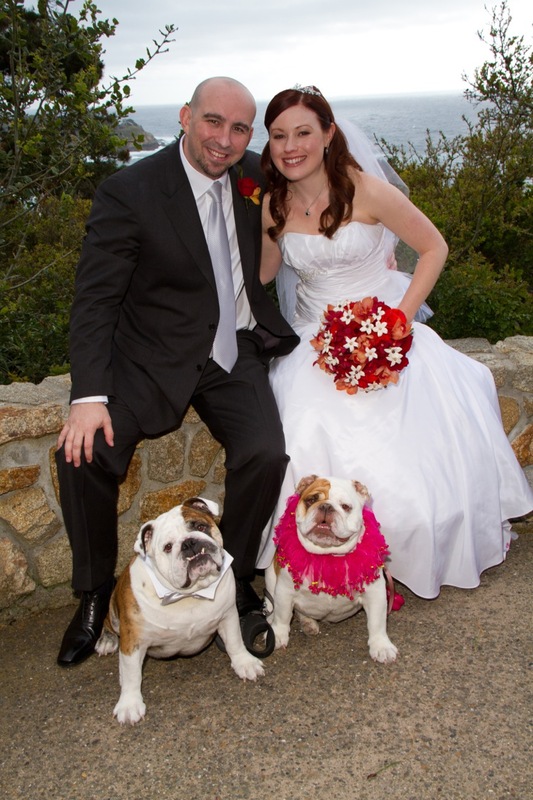 When oncology nurse Dominique Augimeri and emergency room physician Rory Smith decided to tie the knot it was crystal-clear from the get-go that it was to be a family affair – family being their two English Bulldogs, Quebert and Mirra. 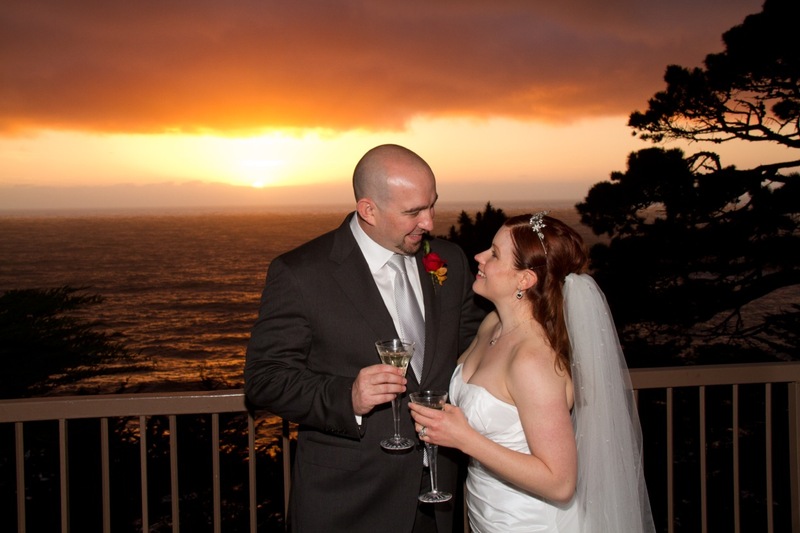 Dominique’s and Rory’s picturesque venue for their cliff side ceremony, The Highland’s Inn in Carmel-by-the-Sea, was the perfect meeting of the mountains and the sea – quite a change from their desert home! Heavens smiled on their afternoon wedding ceremony with unexpectedly beautiful weather, considering it was April AND it had hailed immediately after the rehearsal concluded the day before. 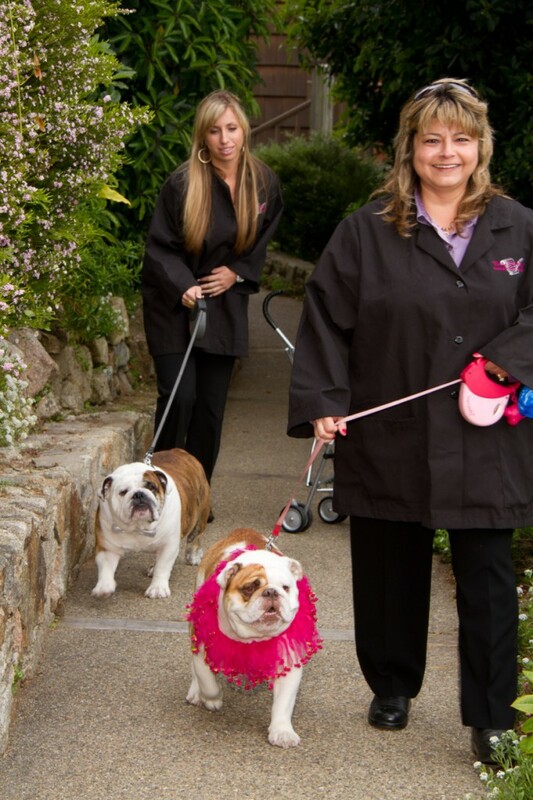 Wedding planner Patty Speirs offered VIP (Very Important Pups) care to Q and Mirra, chauffeuring them to the wedding, getting them dressed in their wedding attire – he in a bow tie and she in a ruffled tu-tu in “Shocking Pink” – and bringing them in for their grand entrance. 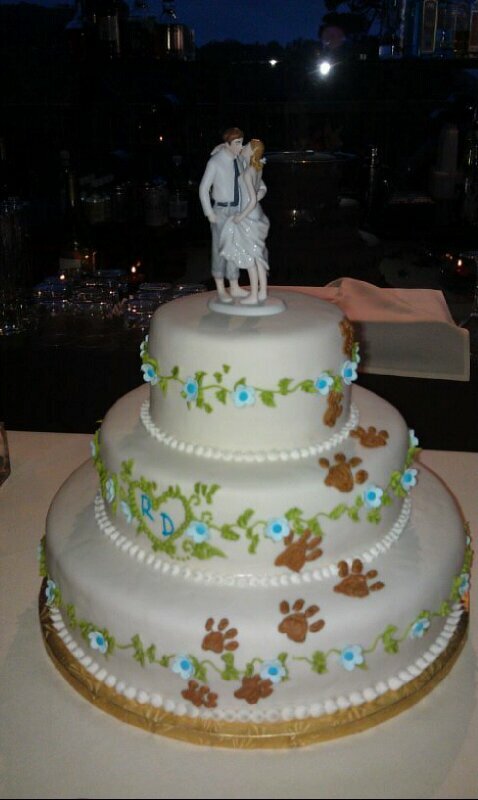 The two four legged stars were greeted with Ohh’s and Ahh’s and were just short of stealing the show for their “Mom” and “Dad.” Having the fur-babies as part of the celebration and mingle with family and friends was, hands-down, the icing on the (wedding) cake! 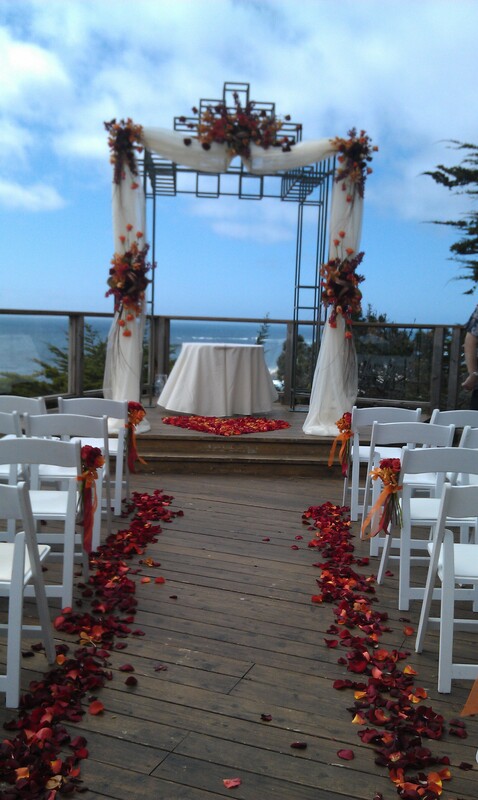 Speaking of which: While Dominique’s and Rory’s wedding color was Caribbean Blue with orange accents, they made ONE design exception: as a wag to their dogs, Patisserie Bechler of Pacific Grove applied brown paw prints running up the three-tiered wedding cake! 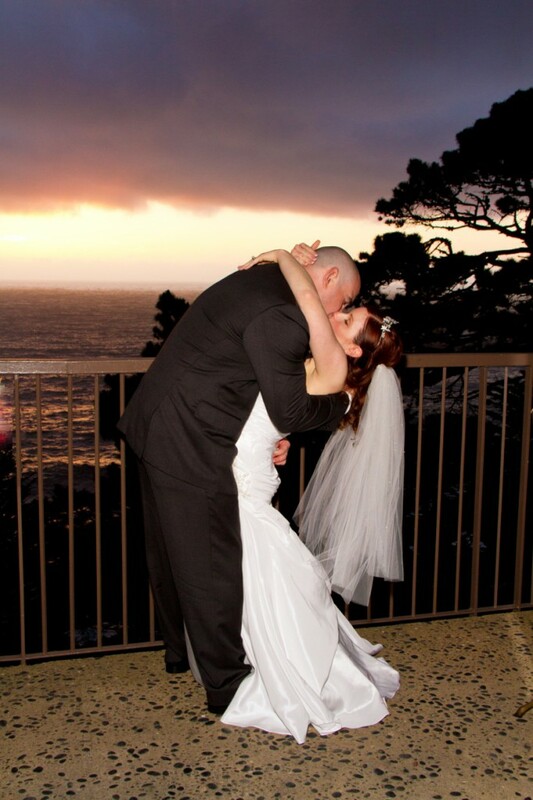 Venue: Hyatt Carmel Highlands, michele.costa@hyatt.com; Caterer: In House; Photographer: McCullough Photography, phototeam@mcculloughphotography.com; Florist: CC Creations, cc.creations@earthlink.com; Hair & Make Up: Salon at Lincoln Lane, salonatlincolnlane@gmail.com; Event and Wedding Coordination: Every Last Detail, patty@eldweddings.com; Ceremony ,Cocktail Hour and Reception Music: Steve Ezzo Entertainment, ezzoentertainment@comcast.net; Wedding Cake: Patisserie Bechler, Gerard@patisseriebechler.com.